Did the earth move for you or was it an act of God? An Iranian cleric has given a whole new meaning to the age old question "Did the earth move for you?" he stated... "Many women who do not dress modestly lead young men astray and spread adultery in society which increases earthquakes." 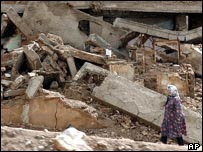 With tens of thousands of people have died in Iran earthquakes in the last decade, the cleric added. More than 25,000 people died when a powerful earthquake hit the ancient city of Bam in 2003.